We’ve heard from the First Doctor that you can’t rewrite history – not one line. 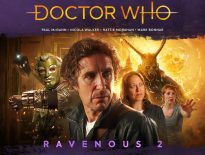 This suspenseful and at times heart wrenching audio drama from Big Finish illustrates exactly why. Cause and effect. Cause and effect. The Crash of the UK-201 is an Early Adventure from the William Hartnell era starring Peter Purves as companion, Steven Taylor and also as the First Doctor. The main focus here though, is on companion, Vicki, played by Maureen O’Brien, who delivers quite a powerful, nuanced performance. Vicki gets dragged through a certain type of hell here and all we can do is observe from the edge of our seat. We’ve seen time travel morality plays about paradoxes and lives not led in the past. What you do if you had that second chance – what if, what if, etc. It should be a tired cliché by now, but writer, Jonathan Morris and director, Lisa Bowerman have managed to trot it out again while keeping it fresh. Perhaps this listener is too jaded, having seen all the tropes by now, but it kept me wondering where they’d go next, which is always a treat. At one point, there’s a sort of tantalising escalation of the story’s stakes that kept me off balance, further making me wonder, dragging me in. The solicitation for the story point blank tells you that Vicki finds herself back in time before she meets the Doctor, on her former ship before it’s crashed (dig out your copies of The Rescue, ladies and gents! ), and it’s up to her if she will, can, or even should save it and everyone on board. Anything else, I’ll leave waiting for you. Purves does the linking narration for the story, which is an interesting nod to the soundtracks of the televised episodes themselves. They of course need them to fill in the blanks but here, the story could have been structured in a certain way so as not to even require narration. Nonetheless, I’m glad they did. They’re a very welcome addition that blends in perfectly with the style of the soundtracks. Really, I wish they’d employ someone such as Purves to narrate all the audio adventures. Having already established it as a comforting assist in so many soundtracks, it might also save us from certain audios where things are sometimes clumsily spelled out during a scene. Sometimes, the best way to tell the story is to narrate it. This production very much succeeds in creating the necessary theatre of the mind. Particular kudos to Bowerman, there. The only negatives I could really find were relatively small ones. Things get a tiny bit repetitive during Part 4 but in trying to correct any time based scenario, it takes a few tries, so that can be forgiven. Steven being able to competently work on and pilot a spaceship involving tech from 200 years in his future might be suspect, but could also be explained away by things he’d learned in his time with the Doctor (or that certain basics in “space piloting” and “space maintenance” don’t change that much over time). At first, one might give an eye-roll at terms like “space homicide” but at the same time, I think it’s another quaint nod toward the era and thus, harmless. All the participating actors do a very nice job adding to the audio presentation, solidly inhabiting their background characters. In addition to playing Steven, Purves also does a very nice homage to the late William Hartnell’s First Doctor, honoring his cadence and timing. This tale, as crafted, certainly plays to the main characters’ strengths and factors in those that are no longer with us. But even though the Doctor is not at all times present, he’s used properly and very well when in the picture. Then there are the little moments. Maureen O’Brien is the story’s hero and has quite the vocal work-out here. She has to present herself at different stages of Vicki’s life and does so quite beautifully. She’s put through an emotional rollercoaster as the story plays out. Once again, the audio format works well here, conveying the small, emotional moments. As time creates ever more road-blocks, dangers, and heartaches for her, you can’t help but feel Vicki’s helplessness as the weight of all time presses in on her. It’s not clear exactly where this story sits chronologically among the televised episodes but it’s obviously nearing the end of her time with the Doctor. Put in context, after this event, I could more easily understand why Vicki was prompted to stay at the end of The Myth Makers and settle down with Troius, leaving behind the TARDIS forever. 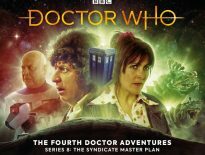 The Early Adventures: The Crash of the UK-201 is out now from Big Finish, priced £14.99 on CD or £10.99 as a download.